The Lucky Creek VIP program is the culmination of the loyalty scheme and wraps up the plethora of promotions and bonuses offered in one cool package. It is aimed at rewarding the loyalty of those who spend a lot of time playing here and provides players with unique prizes. In addition to the standard leaderboard that quantifies every day bets and help players ascend to the highest VIP levels, it also offers immediate gratification. Active members who play the long game can also expect to reap the weekly benefits of a Lucky Creek VIP promotion called the $10,000 CASH Giveaway. The name pretty much speaks for itself and those who sign up for this offer will have a share of winning a chunk of the generous prize pool. This is a recurrent campaign, so players can participate on a weekly basis by opting in every Wednesday. 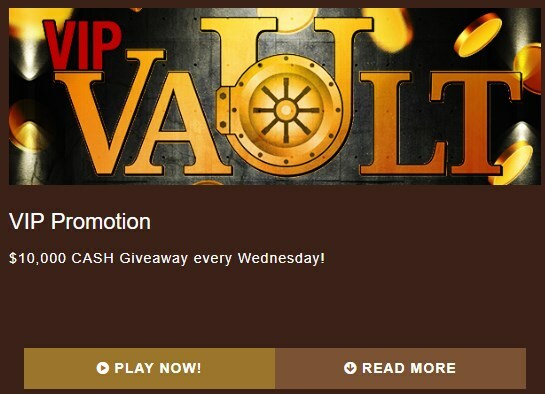 Players can participate in this weekly promotion by making a deposit and enjoying any of the Lucky Creek casino games. The prizes are randomly awarded, so recreational players as well as veterans will have the same chances to walk away with a cool payout. Winning players will be notified by the VIP team and the money should be credited to the accounts of eligible members shortly after the draw. The Lucky Creek VIP offer comes with certain wagering requirements and players have to use the prize money within four hours after being awarded. The standard terms and conditions also apply, so players are advised to go over the rules before signing up. Those who have claimed the welcome bonus are probably well aware of the steps to take if they are to successfully convert the bonus into cashable amounts. For this particular promotion, players don’t have to redeem any bonus code.